An alliance between the Jannayak Janta Party (JJP) and Aam Aadmi Party (AAP) is on the cards. Sushil Gupta, AAP’s Rajya Sabha member, hinted at this tie-up on Sunday. He was here to inaugurate the AAP office. 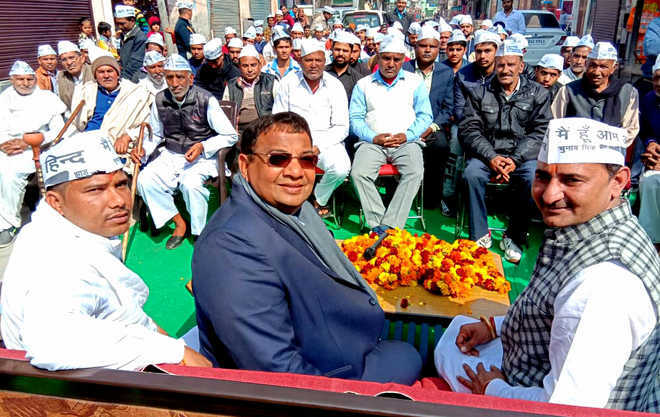 “The JJP and AAP jointly contested the recent Jind byelection in an efficient manner. Both parties are likely to contest the next elections together and form the government in the state,” he told the media. Praising JJP leaders Dushyant and Digvijay Chautala, the AAP MP said they were into politics with new thoughts. “They are into politics of development instead of caste and creed. They have appreciated the work of Arvind Kejriwal in Delhi and want similar development in Haryana,” he said. Targeting Manohar Lal Khattar government, the MP claimed that it did nothing in the past four years except dividing people on caste lines. Government schools and health centres were in a bad shape across the state, but Khattar government was paying no heed to it, he added. “Khattar should learn from Kejriwal, who is working for betterment of every section of the society and leaving no stone unturned for overall development of the state. Kerjiwal has completely changed the picture of government schools and hospitals in Delhi,” he said.